Kiki Bagger and Weston Gaylord in the “Sunday in the Park with George: In Concert” put together by Ken Savage ’14 . Photo by Frank Chen. 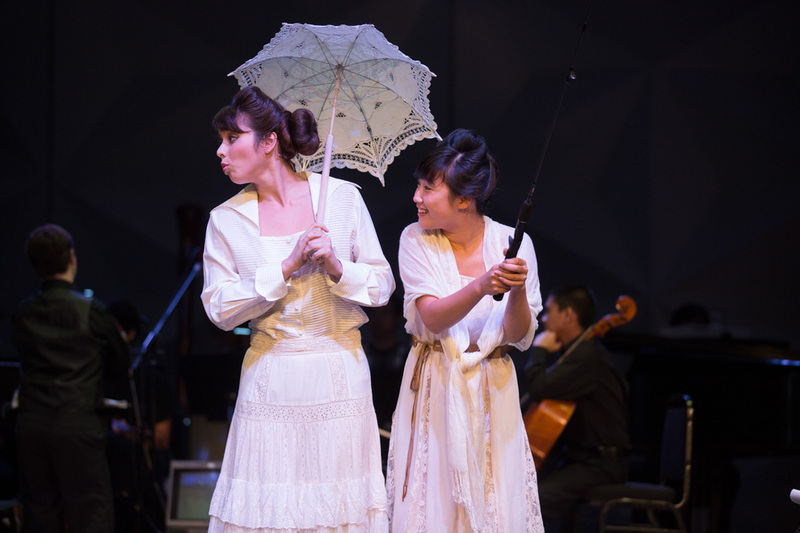 I’m not sure if I will ever see another Stanford student production as well put together as Ken Savage ’14’s “Sunday in the Park with George: In Concert.” It is a difficult work to execute properly, but Savage’s cast and orchestra do justice to the highly acclaimed musical. A personal favorite of mine, Stephen Sondheim’s Pulitzer Prize-winning musical “Sunday in the Park with George” commemorates the life and work of 19th-century painter George Seurat. Absorbed in his paintings, which feature a new brush stroke known as pointillism, Seurat struggles to maintain meaningful relationships with those around him, particularly his lover, Dot. Savage’s production, however, does not struggle in making meaningful connections, inspiring beauty with every note. The most striking element of this production lies in the modest insertion, “in concert.” Unlike a traditional rendition of “Sunday,” Ken Savage forgoes implementing a set, electing to focus on the acting and music instead. The decision is a brilliant one, as the virtually flawless orchestra, led by conductor Joel Chapman ’14, and cast were composed of some of the finest talent on campus. James Garth ’15 performs in “Sunday in the Park with George: In Concert.” Photo by Frank Chen. Sondheim’s musicals — “Sunday,” in particular — rely heavily upon their orchestras for success — much of the music in “Sunday” reflects the tenor of the play. Take, for instance, the quick, sharp violin strokes in “Finishing the Hat,” a song that highlights Seurat’s novel painting technique, pointillism —a style of painting that uses small, distinct dots of color to form an image. Here, the violin strokes imitate George’s brush strokes. 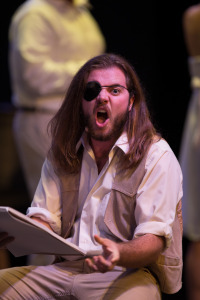 Complementing the superb music was an equally superb cast with Weston Gaylord ’15 at the head. Understated but emotive as Seurat, Gaylord lured us in with his reflective, artistically obsessive interpretation of the tortured painter. 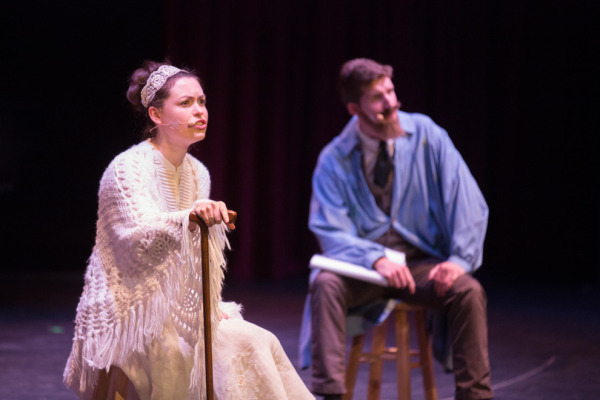 The impossible relationship between Seurat and his lover Dot (Jessica Hoffman ’15) was also the cause of much torment for the audience. You just wanted to hug the playful, yet self-conscious Hoffman as she desperately yearned for affirmation from her uncommunicative lover. Hoffman’s voice rivaled even that of Bernadette Peters, well known for her iconic portrayal of Dot in the original 1983 production. Hoffman is an impressive, versatile actress, who effortlessly made the transition from the jocular, vigorous Dot, to a geriatric Marie, the daughter of Dot, who reflects on George Seurat, her purported father, nearly a century after his death. 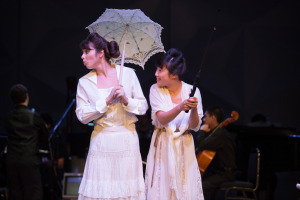 “Sunday in the Park with George: In Concert” performed in Dinkelspiel auditorium. Photo by Frank Chen. While the dynamic duo of Hoffman/Gaylord dominated the stage, their performances were augmented by the supporting roles. James Garth ’15, utilizing a great Cockney accent as the disgruntled boatman, served as a stark juxtaposition to the prim Parisian society around him. Conversely, Praveen Ramesh ’14 conveyed the elitist, high-brow artist with great ease, his sharp gesticulations aptly mirroring his character and the music. While the music and composition were beautifully executed, the lighting, which should be an integral piece to “Sunday,” left something to be desired. Given, however, the otherwise exemplary execution of “Sunday,” this minor fault can easily be forgiven. Moreover, the uninspired lighting was less the fault of lighting designer Ariana Johnson ’17, and more a reflection of the limitations of Dinkelspiel Auditorium. All things considered, the production transcended its limitations, epitomizing what student theater should look like. Under the careful guidance of Ken Savage, “Sunday in the Park with George: in concert” made me forget that I was in Dinkelspiel Auditorium and not on Broadway. Contact Ian Anstee at ianstee5 ‘at’ stanford.edu. Ian Anstee is a Theater Desk Editor for Arts and Life at the Stanford Daily. He is primarily interested in theatre performance but also has an unhealthy obsession with classical music. Ian was born and raised in Havertown, Pennsylvania and is a proud member of the class of 2018. On any given weekend, you may find Ian hiking the dish, achieving nirvana at Windhover Contemplation Center, or binge-watching House of Cards. Contact him at ianstee5 "at" stanford.edu.